On Dec. 12th The Guardian (and most other UK news outlets) reported that the government of Theresa May officially adopted the IHRA Working Definition of Antisemitism. Among the expressions of antisemitism included in the definition, as it relates to Israel, are “drawing comparisons of contemporary Israeli policy to that of the Nazis”. As blogger David Collier demonstrated in a groundbreaking report released yesterday, such Nazi analogies (along with other expressions of antisemitism) are disturbingly common amongst members of the largest pro-Palestinian organisation in the UK, Palestine Solidarity Campaign. With this in mind, note the photo used by the Guardian to illustrate a Feb. 23rd report on protests in Sydney – organised by Palestine Action Group – over the Israeli Prime Minister’s recent visit. Remarkably, nowhere in the story (including in the photo caption) is the antisemitic placard – depicting the Jewish prime minister as Adolf Hitler – even alluded to. 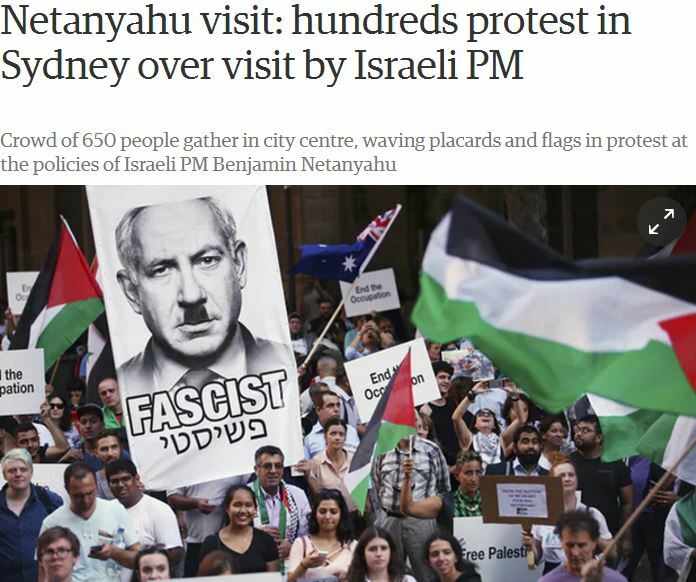 A Times of Israel story about the protest, on the other hand, led with the Hitler sign, in a report titled “Anti-Israel Protesters in Sydney Depict Netanyahu as Hitler”. Australian broadcaster SBS also noted the Hitler comparison in their report on the protest. In the 650-strong crowd, many waved placards and flags and chanted as they moved down Pitt Street and through the central business district as a police helicopter hovered overhead. Let’s conduct a brief thought experiment. Imagine, while Barack Obama was still president, the Guardian covered a right-wing march in which some activists carried large placards depicting Obama as a monkey or an Islamic terrorist. Surely such an unambiguous expression of racism would have been incorporated into the story – if not in the headline (“racism at right-wing protest”), then certainly in the photo caption or body of the text. The Guardian’s failure to convey to readers the antisemitic nature of the anti-Netanyahu placard in Sydney is not in itself antisemitic. However we do believe it’s indicative of their continuing obfuscation of endemic antisemitism within the pro-Palestinian movement and, more broadly, representative of how media outlets can normalise antisemitism without setting out to do so. Excellent analysis – the parallel to a hypothetical Obama placard is spot on! (Recently, a TV sports broadcaster in America was fired for describing Venus Williams as playing like a ‘guerrilla’ – except that, being broadcast, the word sounded identical to ‘gorilla’. He explained that he meant ‘guerrilla’ but got canned anyway. In all fairness, if one is describing a tennis match on television, it is best to not confuse the audience with potentially improper homonyms. I am not a tennis fan, and am unsure as to whether players approach the net in guerilla fashion or not. That said, a more articulate announcer might describe her stealthy, or aggressive, approach. That’s called doing homework and being prepared, and it’s why they get paid the big bucks. The Guardian ignores anti-Semitism much in the same fashion that Donald J Trump ignores anti-Semitism. Yes, I noticed that omission too when I saw the article. While sometimes it could be argued that a picture speaks for itself, in this case it really does need spelling out – in order to make clear what scumbags those people carrying the placard are.